Grape vines can be a great addition to your outdoor space, whether they are growing along a fence, garden wall, arbor, trellis, etc. 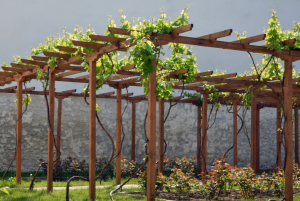 Depending on where they’re grown, grape vines can add visual interest, shade and privacy. If you’re interested in pursuing a culinary hobby, you can learn how to make your own jams, pies, and even wine with the grapes they produce. When choosing a type of grape plant, consult with your local nursery to determine which type of plant is right for your area and which will produce a fruit suitable for your purposes. The soil should be slightly rocky/sandy, not too nutrient rich, and have a pH level slightly above seven. The spot should have plenty of drainage and sunlight. It’s also important to start this process in late winter or early spring. When you buy your grape plant, prune out the weaker canes until you have one leader to achieve a strong root system. Cut it back to three of the strongest buds. After planting your grape plant, wait until the new green shoots have grown about a foot and then choose the strongest one to tie to a support system. Then remove the other buds. During the spring and summer, continually tie the shoot you chose back to the support system – this is called training. It’s important to keep this part of the plant straight and strong because the root system must last for the life of the plant. You should also practice thinning shoots. That means removing unproductive shoots that are not supporting any grape clusters. This practice also helps maintain necessary space, facilitate proper sun exposure for photosynthesis, and effectively distribute a plant’s energy. After the first year, your vine should reach about 30 inches. If it hasn’t, trim back to three buds. Continue last year’s treatment. Don’t be afraid of pruning! Most plants are very vigorous. Established vines can have as much as 90% of growth removed. Once you’ve mastered the art of maintaining your vine, you can relax and enjoy this beautiful addition to your yard. If you need help with this or any of your other landscaping project, please contact Greener Horizon. We are landscaping professionals that would be happy to help you with all of your landscaping needs.